I’m linking this post with the GreensLove bloghop. If you are posting a recipe with any sort of greens this month, check it out and join the party! A couple years ago I made lasagna and garlic bread for dinner on St. Patrick’s Day and happened to mention it in my Facebook status. I don’t really celebrate the holiday, so it wasn’t on my radar, but one of my Facebook friends was like, “Hey! Where’s the corned beef and cabbage?? ?” I’d never made any sort of Irish-type food whether on St. Patrick’s Day or otherwise, and thought I just might try it the following year. And so I purchased my first beef brisket last year. It turned out to be the worst brisket in the history of briskets. It. was. horrid. I still shudder just thinking about it. (80% fat, with a foul flavor.) But, I also made this cauliflower colcannon, which was very good and ended up being the main course rather than our side dish. The pureed cauliflower serves as a lower-carb, more nutritious replacement for the mashed potatoes that colcannon is usually made with. I opted for kale instead of cabbage in my colcannon, but it would be good either way. 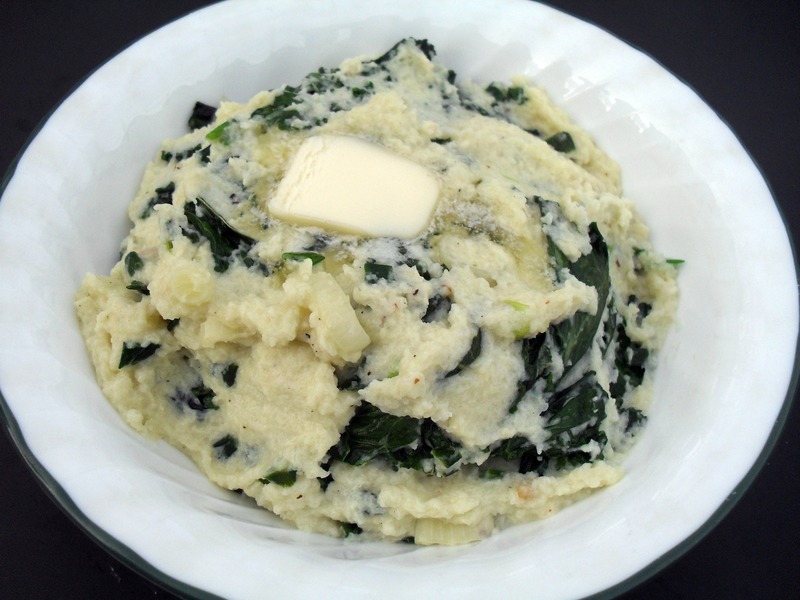 This made a mighty tasty dish, and a good alternative to traditional colcannon if you are going to be eating a high-calorie dessert afterward. Kinda helps balance things out. And I’m a Libra, so I’m all about balance. Cauliflower Colcannon + 1 dozen Andes Mint Cupcakes = balance. Right? Right. Let’s do this. Set a stockpot of water to boil over high heat. Meanwhile, clean and cut the cauliflower into small pieces. Cook in boiling water for about 6 minutes, or until very tender. Drain the cauliflower well and pat it very dry between several layers of paper towels, not allowing it to cool. In the bowl of a food processor, puree the hot cauliflower with the cream cheese, Parmesan, 1 tablespoon of the butter, salt, and pepper until almost smooth. Set aside. Melt the remaining 3 tablespoons butter in a skillet and add the greens. Cook over medium-high heat for about 5 minutes, until greens have wilted and given off some of their water. Add the onions and garlic and cook one minute more. Stir in the cauliflower mixture and thin with milk or cream, if necessary. Serve hot with a pat of butter, if desired. Posted in Lighter Fare, Side Dishes and tagged Atkins, cauliflower colcannon, healthy, kale, low carb. Bookmark the permalink. This looks and sounds good V. I love corned beef and am wondering how in the heck you got a bad one, I’ve never had one I didn’t like! I was thinking of making one soon even though I don’t celebrate the holiday either. Well, I bought it at Aldi, and while I LOVE that grocery store, you get what you pay for when it comes to meat. About all their meat is nasty, except for the lean ground beef and turkey, but only because they don’t have an Aldi brand and sell Butterball. It was so disgusting. Mostly fat, and I don’t dig the fat. I just go to Aldi for produce, canned goods, oats, peanut butter, stuff like that–saves a lot of money but I just don’t buy meat there. Great minds think alike!!!!!!! I did a brisket in beer with potatoes for the upcoming Holiday Recipe Club as an homage to St. Paddy! I like the sounds of this recipe! I have never made corned beef. Did you cook it wrong or was it just bad? I think that this cauliflower dish and a dozen cupcakes sounds like a GREAT meal! What time should I come over? It was just a bad brisket. Learned my lesson finally. It’s really best to buy local meat, not only for taste, but because it’s raised humanely. I’m quite sure all the meat for sale at Aldi came from very sad and tortured animals and it tastes like it. Yum….good healthy alternative to cabbage and potatoes…but I do love the cabbage and potatoes. Corned beef is a MUST around here on St pats day…this year I am making 3! I do them in the crock pot with cabbage. I love the sound of this dish and I am a huge fan of kale! I found your blog through Renee’s BSI this week and so glad I did. I never heard of Colcannon till this year now I’m seeing it all over – just finished ours for dinner tonight – might need to try this next! Love, love, love this!! I’m not a huge potato fan so you’ve just made the ideal dish for me! Wonderful combination of flavors and another way to incorporate Kale into a dish. So glad I found you sharing some greenlove!! A few years ago a friend of mine introduced me to whipped cauliflower – so good! 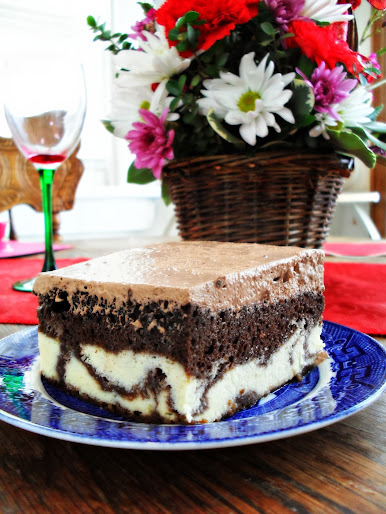 I’m really looking forward to trying this recipe – love everything in it!